According to legend, what is today the Hotel Splendido began life as a monastery. Alas, so frequent were the attacks on it by Saracen pirates during the 16th century that the inhabitants deserted the place and it was left to fall into a state of disrepair for hundreds of years. Thankfully, what remained of the old building was brought back to life during the 19th century when it was transformed into a private summer house. By 1901, however, it had been developed into a hotel and was soon attracting notable visitors keen to take in the delights of Portofino. Some of its early guests included the Duke of Windsor (formerly King Edward VIII), while other famous names to be found in the guest book include Humphrey Bogart and Ava Gardner. 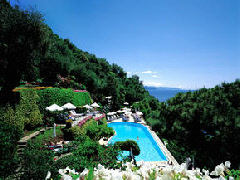 Sir Winston Churchill is also said to have sojourned at the Hotel Splendido. Today, the property offers 69 rooms in all of which 39 are suites or junior suites. Its La Tarrazza Restaurant boasts splendid views over the Tigullio Gulf.